Ein edles Geduldsspiel: Die Leitung der Welt oder die Himmelsleiter. Die sog. 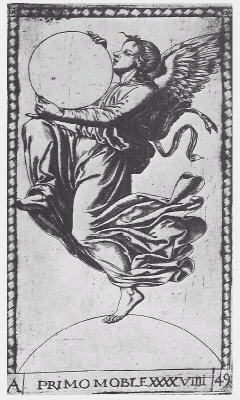 Tarocks Mantegnas vom Jahre 1459-1460 aus Miscellanea di Storia dell'arte in onore di Igino Benvenuto Supino, Firenze 1933, p. 397 - 416.
. However, the other Heinrich Brockhaus, earlier focussed, was son and successor of Friedrich Arnold Brockhaus (1772 - 1823), which became the founder of a German publishing house. It started to produce the still living German language dictionary "Brockhaus", which became very successful with 21 editions since its foundation and had in its latest version of 2005 about 24500 pages in 30 volumes with prices starting at EUR 2,820. The start of this project took place in Altenburg since 1809, after Brockhaus had less success as a publisher in Amsterdam before. Friedrich Arnold Brockhaus became an important figure in the famous Alteburger card playing circle (which emerged from a "Brommesche Tarockgesellschaft"), in which the very popular game "Skat" was developed, a sort of national card game in Germany later. The first document about Skat is noted in 1813, the important further development, the "Reizsystem" of Skat, is recorded for 1818. Later in Altenburg the playing card fabric Gebrüder Bechstein was opened in 1832, from which developed the Altenburger Spielkartenfabrik A. G. in 1886, which was taken by Carl Schneider in 1893. Carl Schneider, who sold the fabric to "Vereinigte Stralsunder Spielkartenfabrik AG" in 1897, became co-founder of the playing card museum "Skatheimat" in Altenburg, which became in 1923 located in the Altenburger Schloss and still exists, though the meanwhile existing Deutsches Spielkarten Museum in Stuttgart-Leinfelden has possibly nowadays the higher ranking in Germany. The united fabrics of 1897 developed further and became the most important German playing card producer after 1900 for some longer time, other important productions like "Bernhard Dondorf" from Franfurt and the "Bürgers" from Cologne were bought later. It seems likely, that the overwhelming success of the game of Skat and the similar grandios success of the Brockhaus dictionary and the success of the city Altenburg as the dominant German Kartenspielstadt have a causal relation to each other, though this relationship appears not officially at the surface. The game Skat was in Altenburg the dominant game in 1820-24 (F.A. Brockhaus died 1423, his 20 years old son Heinrich took the responsibility), later all over Germany. Cusanus wrote in his late years about a game - De Ludo Globi (about a game with bowls). At many pictures of the Mantegna Tarocchi one finds "round objects", interpreted as "spheres".